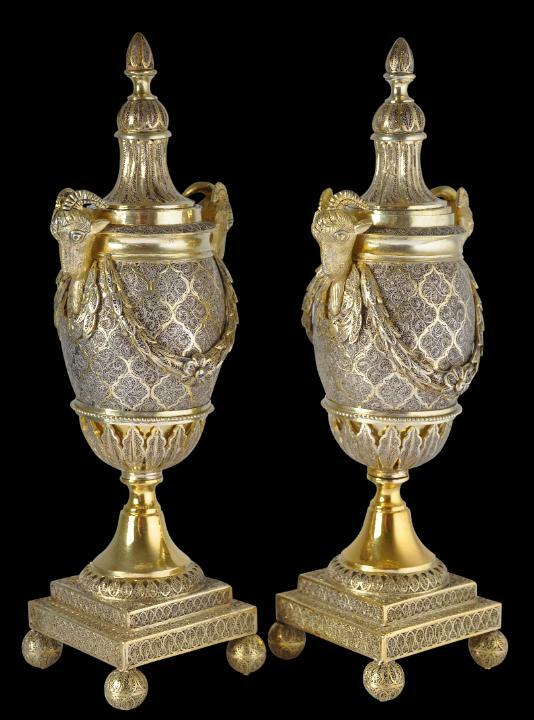 for such a pair of George III cassolettes by Matthew Boulton, circa 1770, sold as lot 144 at Christie’s New York in October 2010.) Another pair of gilded silver and blue john stone are in The Royal Collection of Queen Elizabeth II and are illustrated in Mason (2009, p. 160). for example.) The cassolettes here are remarkable because they are entirely based on English design, form and function. Each vase or cassolette has a reversible finial candle-holder above an amphora-shaped body draped with swags headed by a pair of gilded ram’s heads. The bodies of each rise from a square stepped plinth, which sits on four fine silver filigree ball feet. Matthew Boulton (1728-1809) was a highly influential Birmingham-based, English designer and manufacturer of metal products, both industrial and ornamental. 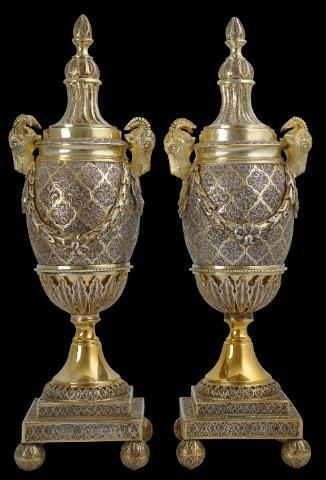 His ornamental designs included silverware and items mounted with ormolu, previously a French speciality, whereby elaborate metal fittings were gold plated with mercury-fired milled gold. Two others pairs have come onto the market in the last ten years but both these examples were missing the ball feet. 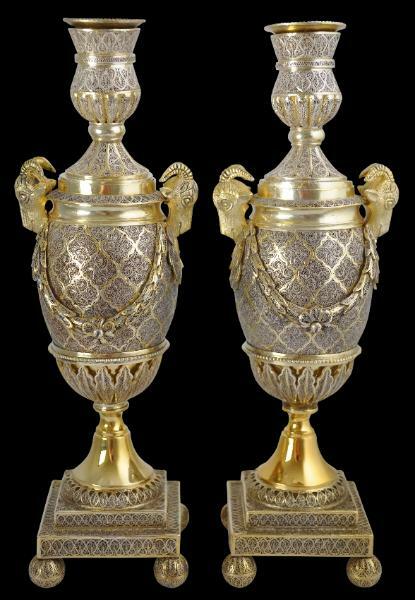 One was silver and the other was gilded, compared with the pair here which are parcel-gilded (ie partly, selectively gilded and not gilded). The pair here are in fine condition. The gilding is bright and fresh. There are some barely perceptible (and expected) losses to the filigree here and there. The gilded silver cone sections that rise above the plinths might be early but later replacements. Other examples have more filigree work in this area. 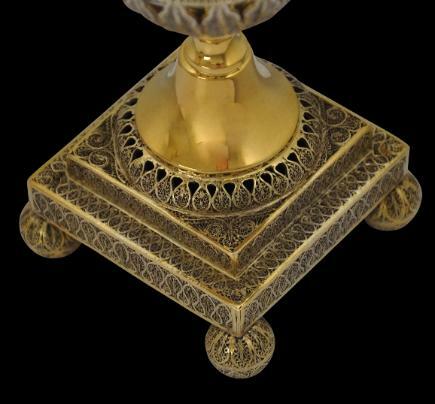 However, the original designs by Boulton also have solid silver-gilt feet and bodies of different material such as blue john stone. 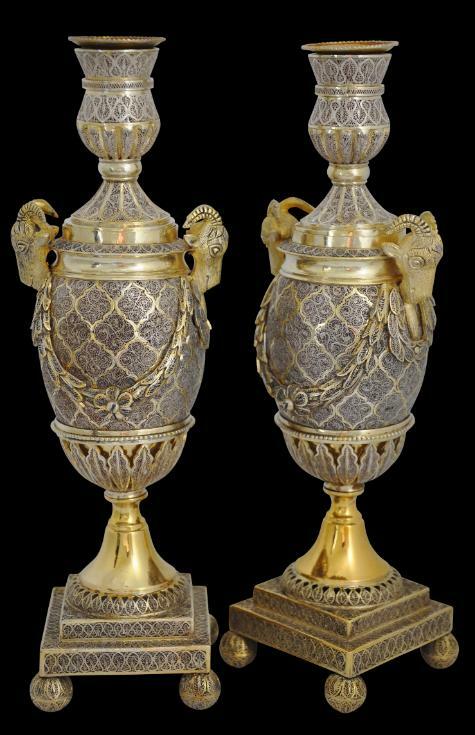 Overall, this pair of cassolettes tell a remarkable tale of late 18th century cross-cultural exchange, whereby very English designs were picked up by Indian Muslim silver workers more adept at producing betel boxes and the like for the local market. They are remarkable in every aspect. Matthew Boulton: Selling What all the World Desires, Birmingham City Council/Yale University Press, 2009.
et al, Silver: Wonders from the East – Filigree of the Tsars, Lund Humphries/Hermitage Amsterdam, 2006. 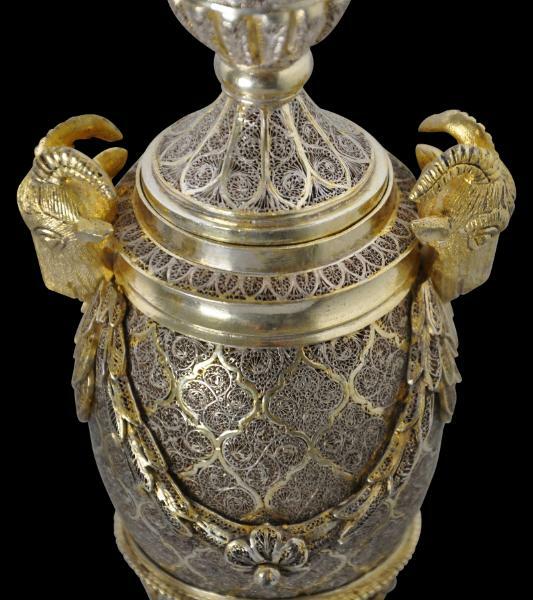 Mughal Silver Magnificence, Antalga, 1987.